I recently discovered that water from this past summer’s rainy season seeped inside my trekking poles and never dried. The remaining water began to work it’s corrosive magic on the inside of the poles and the adjustment barrels became challenging to unlock and lock. The following is a guide for servicing Leki brand trekking poles so they’ll be in top condition the next time you head outdoors. This is also a great primer for troubleshooting your poles in case you run into a problem on the trail. Why Leki trekking poles? Well, I just happen to use their poles and I love them. It doesn’t mean that other brands aren’t just as good. Please note, not all manufacturers use the same adjustment systems, so this recipe may not work for everyone. However, many other brands do use similar systems, and virtually every trekking pole on the market can be taken apart and serviced. Therefore, use this as an excuse to familiarize yourself with your own trekking poles, whether they’re Leki trekking poles or not. It always pays to know how your equipment works. Position your sticks. 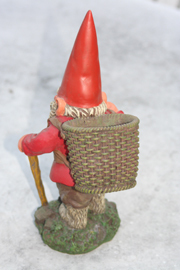 I hope that your gnome will be more helpful than ours. Pull your Leki trekking poles apart. Loosen each section of your pole by turning. (The right section should spin toward you if positioned like the photo). Pull past the “Stop Max” line and give a quick pull. The section should pull out completely with the expanding system attached. Leki also calls the expander the ELS. (Easy Lock System). If you can’t find the expander then see the troubleshooting section below. Unscrew the expander. Turn toward you according to the photo. You’ll see the expander begin to separate. If you can’t unscrew the expander then it’s probably jammed. This is the number one reason that trekking poles don’t tighten. You’ll have to use a bit of strength and finesse to get it loose. (Proceeding to step four and trying to muscle the orange piece often works). Remove the expander. Leave the little orange piece, and spin it up and down the screw to access all of the threads. Clean. Give each Leki trekking poles section a thorough rub-down with a rag to remove excess dirt. Be sure to wipe off any corrosion. Fine steel wool or an old toothbrush does a nice job of restoring the threads to their original shine. Reassemble. Snap the expander back in place and spin away from you to shrink the expander, but don’t over tighten. Reinsert the poles and adjust. The right section should spin away from you if positioned like the photo in Step Two. Repeat. Proceed to the next section of the pole. Our little friend has had enough of this. He’ll take a wooden stick any day. A. I can’t find the expander. 1. The expander fell off the screw head. 2. The expander is inside the shaft above it. 3. Push the section that won’t tighten all the way into the section above. 4. Trap the expander and twist the shaft in a tightening motion a few turns. B. My poles won’t lock. 1. Pull the pole sections apart. 2. Locate the expander and hold with thumb and forefinger. 3. Spin shaft so that the expander opens wider and touches the aluminum wall of the section it is going into. 4. Put shaft at the desired length and continue to twist pole until resistance is met. C. My Leki trekking poles won’t turn or come apart at all. They are totally jammed. 1. Visit our blog post Help! My Leki trekking poles are stuck. How do I get them loose? Please contact me if you run into trouble or have any questions. I’d love to hear from you.